Jerry Jacoby: Kid Motivator teaches character and integrity. Listen to what people are saying about Jerry. Jerry Jacoby’s professional comedy, music, and audience-involving antics encourage your students in self-esteem, respect of others, respect for authority, honesty, courtesy, and responsibility. The combined experience of over 4,000 school and family performances, 14 years as an educator, and 21 years as camp speaker has taught Jerry the heart of children. Jerry knows his audience! Learn more about Jerry. 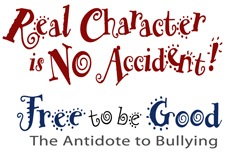 Jerry effectively teaches children character and integrity with Real Character is No Accident and Free to Be Good: The Antidote to Bullying. Jerry effectively teaches skills for dealing with peer pressure in Junior High - The Best Ten Years of my life and, decision making, and accepting reality in Hot Dogs on a Nervous Stomach. Jerry Jacoby entertains with happy and funny songs that teach kids of all ages integrity and character skills. Sing along. Laugh along. Visit our product page for other CDs and how to purchase.